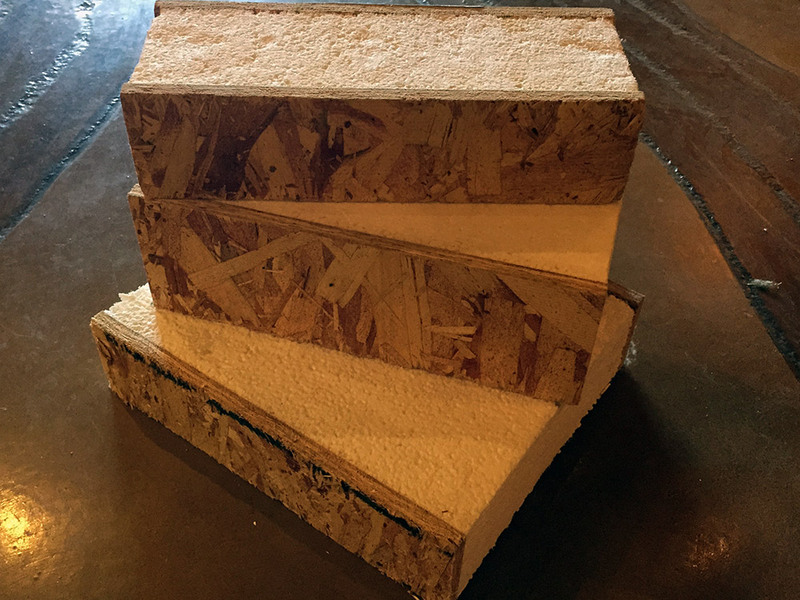 Structural Insulated Panels (sometimes called “SIPs”) are building panels made from compressed wood and styrofoam. Technically, they’re actually building panels made out of expanded polystyrene sandwiched between two sheets of 7/16th inch oriented strand board (OSB). We generally use 6″ SIPs for walls and either 10″ or 12″ SIPs for roofs. We often use SIPs when building timber frame homes, since they work so well together. We first raise the timber structure into place, then add the panels afterwards. It’s a building method that is very quick to put together, extremely energy efficient, produces minimal waste, and is very airtight. The homes we build from SIPs are so airtight, in fact, that ventilating your home takes on a whole new importance and an air exchanger is needed. We like to quote one family who lives in a home built with SIPs: “It’s like living in a thermos!” There are many companies that make SIPs, but we’ve worked with InsulSpan and Enercept the most. Below is a video from FOX21 News that shows our crew putting SIPs into place on a LEED® Platinum home we built in Divide. Andy Stauffer is the founder and President of Stauffer & Sons Construction, a custom home builder in Colorado Springs, Colorado. Andy has over twenty years of experience in residential and commercial construction and is a contributing writer for Builder Magazine, Builder & Developer, Options for Today's Fine Homes, and more, and has been featured in NBC News, US News & World Report, and more.